Slack is a messaging app that gives you one platform for all your communications, offering real-time messaging, file sharing, archiving, and search. It’s built for modern teams so you can have all your communication in one online location, instantly searchable, and immediately accessible from whatever connected device. Slack works with more than 1,500 external apps and services, giving you one fully flexible and extendable platform. It has several internal and external sharing options so you can receive and share files with anyone. It offers advanced search, filters and sorting that make it easy to get the right files that you need. You can set filters by variables such as recent type, relevance or file type. The solution comes with fully native apps for iOS and Android to give you full mobile functionality. It also has read state synchronization like for instance when you read something on your phone, your in sync laptop will know about it and automatically mark those messages as read. Modern teams require responsive and unified communication hub that not only collates all channels they are using, but also stores their conversations in robust databases to make them easily searchable and available at any moment. Whatever action you perform with it is completed since on an intuitive and easy-to-use dashboard. There is no need for complex installations, maintenance or training since the platform is fully cloud hosted. Slack is built around a channel format that allows you to quickly go from asynchronous to synchronous communication, giving you real-time response. Its centralized and searchable archive of messages is made available not just to people on your team today, but also to those who’ll get on board later on. Other helpful features include open communication channels, private groups, internal and external sharing, flexible browsing, and many more. Slack is one of the most extensively integrated platforms around, which is why it is the communication and collaboration platform of choice by teams from top global companies. The system will blend and work with almost every leading software out there that you use such as Dropbox, Zendesk, Google Drive, MailChimp,GitHub as well as all major social networks. Slack also has a strong SMB following and orientation because you can start off with a robust free plan with no restrictions on time and number of users. What Problems Will Slack Solve? When you switch to a centralized system for internal communication like Slack, you get an immediate benefit in the form of cross-team transparency. The tension between “I want to be kept in the loop, so please CC me” and “I get way too much email, so stop CCing me on everything” disappears. By default, communication is public, and everyone can see what’s going on everywhere else. The need for status reports and daily stand-up meetings decreases. Now, marketing can see what challenges the sales team is facing, engineers get a glimpse of what designers are working on before it gets handed over, technical operations have insight into what’s in the customer support queue, etc. Having a searchable history of the entire team’s communication dramatically accelerates the process of getting up to speed. Compared to your first day at an email-based organization, where you start with an empty inbox, with Slack you can scroll back over every decision, every discussion, every link, every file, and everything else. In Slack, you can quickly pick up on subtle aspects of a company’s culture, the norms for communication, who knows the answers to what kinds of questions, and who really makes the decisions and the kind of soft knowledge that can take a long time to absorb without Slack. 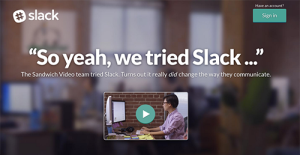 Slack saves you tons of time associated with triaging emails and status update meetings. You are much more efficient and your throughput shoots through the roof. Lastly, Slack is an easy and fun tool to use. Onboarding is intuitive and teams quickly adapt to the new model of real-time messaging which we are accustomed to in our personal lives. Since each company has specific business wants, it is advisable for them to desist from looking for a one-size-fits-all faultless software application. Needless to say, it would be futile to try to find such an app even among market-leading software platforms. The smart thing to do would be to catalog the various important elements that need consideration such as main features, budget, skill levels of staff members, company size etc. Then, you should do your research thoroughly. Read some Slack reviews and look into each of the other solutions in your shortlist in detail. Such exhaustive homework can make sure you weed out ill-fitting systems and select the app that provides all the aspects you need for business success. We realize that when you make a decision to buy Communications Software it’s important not only to see how experts evaluate it in their reviews, but also to find out if the real people and companies that buy it are actually satisfied with the product. That’s why we’ve created our behavior-based Customer Satisfaction Algorithm™ that gathers customer reviews, comments and Slack reviews across a wide range of social media sites. The data is then presented in an easy to digest form showing how many people had positive and negative experience with Slack. With that information at hand you should be equipped to make an informed buying decision that you won’t regret. What are Slack pricing details? What integrations are available for Slack? Pros: It is very easy to use, even if you are a total beginner. I like the option of private channels as well as custom emojis. Cons: There is nothing problematic. It would be better to have a few more options for notification customization. Pros: Slack allows us to create groups of users or to select users who want to participate in the conversation. I like the integration with Trello and GitHub and we always get notifications when something is actioned in one of those particular apps. The interface is clear and easy to use. The buttons are understandable. I also like that it has access to different 3rd party apps and this means that we can include GIF’s in our messages. The web-based help support is easy to use. Cons: Sometimes we are overwhelmed from the messages from other web apps and the fact that is most frustrating is that you cannot control what notifications you want to receive. They could also improve the search function because sometimes it’s difficult to find some old messages. In addition, I found the Slackbot useless. And when the group is set to “Private” then the notifications are easy to miss. It is very easy to use, even if you are a total beginner. I like the option of private channels as well as custom emojis. The highlights of Slack are the flexibility in adding graphics and icons, the archive feature, and the ability to conduct private conversations with several people. If you need more information about Slack or you simply have a question let us know what you need and we’ll forward your request directly to the vendor.